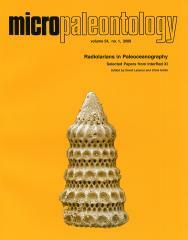 ABSTRACT: Quantitative analysis of radiolarian assemblages from the late middle Eocene to late Oligocene at Hole 689B (ODP Leg 113, Maud Rise, Southern Ocean) reveal that radiolarian faunal turnovers occurred at ~38.5 Ma (Subchron C18n1n), ~36.3 Ma (Subchron C16n2n), 34.5-33.9 Ma (Subchron C13r), ~28.3 Ma (Subchron C9r), ~26.9 Ma (Subchron C8r), and 26.4-26.2 Ma (Subchron C8n2n). These faunal turnovers are characterized by an increase or decrease of the Antarcticdiagnostic assemblage. Furthermore, species diversity indexes such as species richness, diversity and equitability and total accumulation rate of radiolarians decreases signifi cantly near the turnover events. The patterns of increase and decrease in the Antarctic group suggest that the faunal turnover events are interpreted as replacement events between the Antarctic and Subantarctic assemblages. The intervals with higher levels of the Antarctic group at 38.5-36.3 Ma, 34.5-33.9 Ma, and 28.3-26.9 Ma were under the infl uence of the Antarctic bioprovince. Two faunal turnover events at 34.5-33.9 Ma and ~28.3 Ma are correlated with the positive shift of δ18O isotopes in the early stage of Oi-1 glaciation and Oi-2a event, respectively. Events at ~36.3 Ma and 26.9-26.2 Ma when the Antarctic-dominant assemblages decreased correspond to warming events in late Eocene and the late Oligocene warming, respectively. Thus, faunal changes in radiolarians can be used to monitor paleoceanographic change in the Southern Ocean and migration of the high-latitude water mass boundary during the Eocene- Oligocene interval.